Anyone who tries to keep up with the dizzying pace of DC restaurant openings can’t help but feel overwhelmed. Thankfully Nevin Martell and Al Goldberg, co-creators of New Kitchens on the Block (NKOTB), have developed a sure-fire way to give food-obsessives like myself a jump start on what’s ahead in DC dining. NKOTB 2.0 (the first NKOTB took place last summer) was held March 19 at Mess Hall. 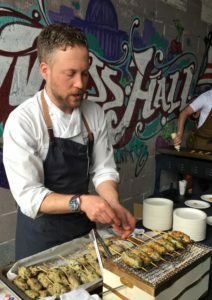 Goldberg is the founder of Mess Hall, a culinary incubator in DC. Martell is a D.C.-based food, travel, and lifestyle freelance writer. They created NKOTB to provide chefs and entrepreneurs a forum to showcase their upcoming ventures. 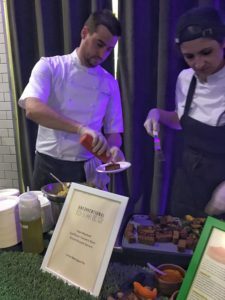 The March 19 event was a fun-fest featuring nine upcoming restaurants, plus a coffee roaster and a wine bar. 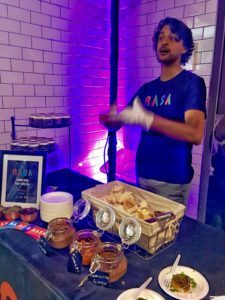 Rahul Vinod and Sahil Rahman will open Rasa, a fast casual Indian restaurant, in Navy Yard in the fall. It’s not the first foray into restaurants for a duo named Vinod and Rahman. Their fathers, Chef KN Vinod and Surfy Rahman, co-own Indique and Bombay Bistro. 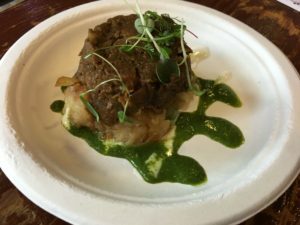 Rasa served up a noteworthy braised lamb dish with shallot potatoes. Their own blend of chutneys- including tamarind-ginger, tomato, and spicy coriander chili -add zing. The dish that stirred up the most buzz in the hall came from David Deshaies and his upcoming Unconventional Diner. 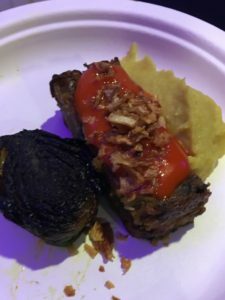 Count me among the skeptics who couldn’t imagine falling head over heels with vegan meatloaf. But the blend of lentils and mushrooms, served with a cauliflower and turmeric mash, was bursting with flavor. Lemon meringue pies served in a lemon were another big hit. Unconventional indeed. The talented Johnny Spero (Minibar, Columbia Room) is set to open Reverie in Georgetown later this year. I plan to be one of the first diners through the door. The menu will be Modern American food, inspired by Spero’s travels in Denmark, Japan, and Spain. For NKOTB 2.0 he served tsukune- grilled Japanese chicken meatballs. After sampling food at every station, along with sips of beer and wine, I needed a pick-me-up. Thank goodness for Katz District Coffee. Founded by Kyle Katz and Brian Edling, the locally-roasted beans are only available online. The Peru blend with notes of vanilla, lemon-lime, and toffee is terrific. Their website and I are destined to become good friends. The event also featured tastes from the upcoming The Salt Line, a New England style fish house from Chef Kyle Bailey; Sugar Shack Donuts & Coffee in Shaw; Taqueria del Barrio in Petworth; a second location for Lupo Verde Osteria, opening on MacArthur Blvd in the spring; June a pop-up featuring new American cuisine; Flamant, a casual neighborhood bistro featuring European country cooking from Chef Frederik de Pue; and Dio Wine Bar, which will bring natural wines to H Street NE this summer. Goldberg and Martell confirm that NKOTB 3.0 will happen, so stay tuned. I can’t wait to jump back into Mess Hall for more.